The United Kingdom Advising and Tutoring group (UKAT) held its annual conference in Derby from the 27th to the 28th March 2018. 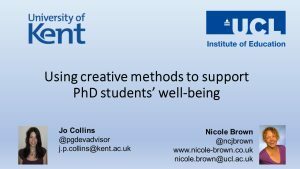 In our interactive workshop Jo Collins and I engaged attendees in means and tools we use to support and foster PhD students’ well-being through the employment of creative methods for reflection. The presentation used in our interactive workshop can be downloaded from here. Globalisation, rising social inequality, job insecurity and increased pressures to succeed are leaving Higher Education students more susceptible to mental health issues than ever before. For example, a recent Belgian study documents, how key stressors on PhD students include financial insecurity, job insecurity in academia and work life balance (Levecque et al., 2017). Equally, societal changes mean that mental health concerns, work-life balance and well-being are becoming more openly discussed. Mental Health, while not reducible to well-being, is a key component of this debated term (Dodge et al., 2012). Students seek more help and universities are largely resourced to provide more support. This is shown in HEFCE’s 2017 invitation to Higher Education institutions to submit proposals for its Catalyst fund specifically to focus on well-being of researchers . However, existing research and initiatives demonstrate that well-being comes from within and as such cannot be done to people. The 2009 National Accounts of Wellbeing (2009) explains that well-being is ‘a dynamic state, in which the individual is able to develop their potential, work productively and creatively, build strong and positive relationships with others, and contribute to their community’ (p. 18). In our interactive session we presented a workshop that is delivered to postgraduate students at the University of Kent’s Graduate School. This workshop integrates our complementary approaches, utilising Nicole’s expertise in creative methods, and Jo’s coaching skills. The workshop provides participants with reflective tools, which, if applied consistently, help students understand their innermost emotions, concerns and needs. This recognition of personal experiences and feelings provides the first step towards developing strategies for wellbeing. The role of creative methods in relation empowerment is exemplified in existing work (Lyon, 2016; Brown, 2017; Brown, 2018). Our key objective for this interactive workshop was to demonstrate practical approaches in developing students’ wellbeing. Our learning outcomes were to prompt reflections amongst participants about how such methods might impact on their practice and activities; what the boundaries might be in such interventions; and how to evaluate their efficacy. To this end, we asked delegates to experience the student workshop by actively undertaking the three student workshop activities: “Who am I?”, “What does your learning journey look like?”, “What is your PhD?”. The activity “Who am I?” draws on the use of objects and metaphors, and through the process of reducing an experience to its essence and subsequently elaborating on that essence, participants will implicitly learn how to reflect deeply. The following two activities build on this process of reduction and elaboration through the use of a river drawing activity and LEGO bricks. Participants work in groups to represent their learning journey as a river and will then build their individual LEGO model of learning. In the final plenary discussion, we explored the benefits and limitations of this particular approach to developing students’ resilience and well-being. Together with delegates we evaluated the boundaries of supporting students with their mental health issues. Levecque, K., Anseel, F., De Beuckelaer, A., Van der Heyden, J., Gisle, L. (2017) Work organization and mental health problems in PhD students. Research Policy, 46(4), 868-879. Lyon, D. (2016). Researching young people’s orientations to the future: the methodological challenges of using arts practice. Qualitative Research, 16(4), 430-445. National Accounts of Wellbeing (2009). http://b.3cdn.net/nefoundation/2027fb05fed1554aea_uim6vd4c5.pdf (accessed 18/1/18). Nicole Brown is a Lecturer in Education at UCL Institute of Education, and a doctoral researcher at the University of Kent. She holds the Magistra Philosophiae, Master of Teaching, Diploma in Translation and is a Senior Fellow of the Higher Education Academy. Nicole is a qualified teacher in Austria and the UK and worked as a secondary teacher of modern foreign languages before moving into higher education. Her research interests relate to identity and body work, physical and material representations and metaphors, the generation of knowledge, and advancing learning and teaching within higher education. Jo Collins is Postgraduate Development Advisor at Kent’s Graduate School, and has been working in the field of researcher development since 2011. Prior to this Jo taught at Kent and (Canterbury) Christ Church Universities and completed a PhD in English Literature. Her research interests are in the field of researcher development (specifically wellbeing, coaching and mentoring).